Here’s some science for you: your lips don’t have oil glands like the rest of your face. What that means is that they are dependent on environmental hydration, primarily via humidity. If you like in an area with little to no humidity then you may suffer from perpetually dry lips. Humidity naturally decreases in climates that have colder seasons, which causes lip dryness (our technical term is “chap”) to increase. If you are licking your lips, thinking that you’re hydrating them, stop right now. Thank you very much. The digestive enzymes secreted from your tongue will dry out your lips even more; potentially even causing irritation if they get into the chap. Certain topical medications, such as retinol and acne creams, can also cause your skin to dry out so we recommend avoiding your lips when applying. If you are looking for the cure this cuffing season, look no further. Literally, just scroll down and we’ll hook you up with our favorite lip saviors. This is the most luxe lip balm on this list but it’s totally worth the hype. La Mer’s The Lip Balm harnesses the brand’s Miracle Broth™ to deliver high quality moisture and regeneration to your lips. Fun fact: the founder of La Mer suffered intense chemical burns that he then healed with this potion, created using the natural botanicals of the sea. Not so fun fact: lips are one of the first places to show signs of aging. This is definitely the overall top contender on this list. Nannette de Gaspé's Baume Noir is 95% clean beauty, with a decadent texture. This balm contains some of your usual anti-aging suspects with collagen derivatives, omega oils, and hyaluronic acid. The special feature of this balm is the brand’s Concentré Noir™, which includes superfruits, Tahitian pearl, and black tea ferment. Please and thank you. The original Baume de Rose is a favorite in all makeup artists’ kits. Now you can get the same formula in a tinted version. Vitamin E and shea butter help to moisturize dry lips and ceramides help to rejuvenate the skin. Baume de Rose Nutri-Couleur comes in eight shades and is an easy and powerful substitute for your matte liquid lipsticks. Lilah B.’s lip balm is aptly named b.kissed. It’s free of petroleum, mineral oil, and lanolin (a common allergen). What does it contain? Menthol to refresh your pout and lavender to sooth your worries. The base is of beeswax so while this formula isn’t vegan, it’s one of the cleanest formulations on the market. We have yet to meet a Sisley product we don’t like. This goes double for the brand’s Nutritive Lip Balm. 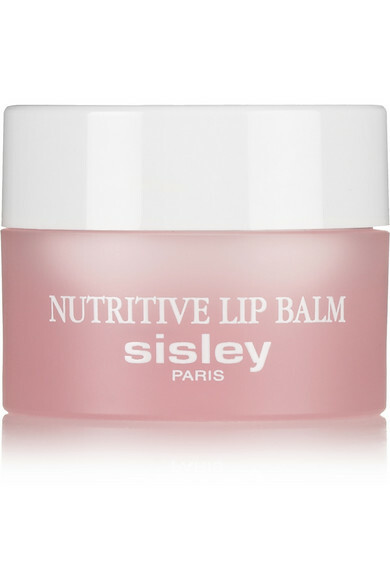 While some balms have the common ingredients of sunflower oil and shea butter (which this formula also boasts), the folks at Sisley have upped the balm game by adding hazelnut and plum kernel oils. The result is a thick rescue balm that melts into a perfect lip oil. Use it overnight to heal your pout or pop it on before you do your makeup to prep your lips for some color. Dry lips is one thing that we will not be letting go this season.